I wanted to share an important presentation by Dr. Steve Stice. He is a featured researcher in “News Behind the Neuroscience News”. I have featured numerous posting of innovations by Dr. Steve Stice and our friends at Aruna Biomedical. Here I would like to share a publication by Steve and his team featuring a new slant on isolating eSC Derived hNP Neural Progenitors. This study also includes methods for sorting hESCs, hNP cells and hMP cells. Mahesh C. Dodla, Amber Young, Alison Venable, Kowser Hasneen1, Raj R. Rao, David W. Machacek, Steven L. Stice. Differing Lectin Binding Profiles among Human Embryonic Stem Cells and Derivatives Aid in the Isolation of Neural Progenitor Cells. PLoS ONE 6(8): e23266. doi:10.1371/journal.pone.0023266. Abstract: Identification of cell lineage specific glycans can help in understanding their role in maintenance, proliferation and differentiation. Furthermore, these glycans can serve as markers for isolation of homogenous populations of cells. Using a panel of eight biotinylated lectins, the glycan expression of hESCs, hESCs-derived human neural progenitors (hNP) cells, and hESCs-derived mesenchymal progenitor (hMP) cells was investigated. Our goal was to identify glycans that are unique for hNP cells and use the corresponding lectins for cell isolation. Flow cytometry and immunocytochemistry were used to determine expression and localization of glycans, respectively, in each cell type. These results show that the glycan expression changes upon differentiation of hESCs and is different for neural and mesenchymal lineage. For example, binding of PHA-L lectin is low in hESCs (14±4.4%) but significantly higher in differentiated hNP cells (99±0.4%) and hMP cells (90±3%). Three lectins: VVA, DBA and LTL have low binding in hESCs and hMP cells, but significantly higher binding in hNP cells. Finally, VVA lectin binding was used to isolate hNP cells from a mixed population of hESCs, hNP cells and hMP cells. This is the first report that compares glycan expression across these human stem cell lineages and identifies significant differences. Also, this is the first study that uses VVA lectin for isolation for human neural progenitor cells. By comparing hESCs, hNP cells and hMP cells, we have identified glycan structures that are unique to hNP cells: GalNac end groups (VVA), α-linked N-acetylgalactosamine (DBA), and fucose moieties α-linked to GlcNAc (LTL). Future studies help in identifying the roles of these glycans in cell maintenance, proliferation and differentiation fate. I will keep you posted on these future Studies. I first featured Dr. Steve Stice in August 2008. I have since done follow up posts based on the excellent studies they have been conducting using our STEMEZ (TM) Human Neural Progenitor & Neuron Discovery Kits. I would like to highlight a poster based on research Steve and his Team conducted with Platypus Technologies. Allan C. Powe, Jr., Kathryn L. Hodges, Jamie M. Chilton, Scott Gehler, Renee L. Herber, Keren I. Hulkower, Steven L. Stice. Identification of stimulators and inhibitors of cell migration in human embryonic stem cell derived neural progenitors using a novel, high throughput amenable assay platform. 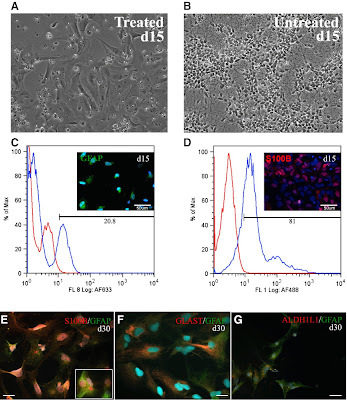 Investigates the migratory behavior of an adherent monolayer neural progenitor cell line derived from human embryonic stem cells (hNP1 ™; ArunA Biomedical)using a novel 96‐well based cell migration assay platform (Oris™ Cell Migration Assay; Platypus Technologies) amenable for high throughput screening. The assay platform uses stoppers to create central exclusion zones within the wells; cells are plated outside the zone and migrate inward once the stopper is removed. Data suggest this is a tool for understanding proper nervous system development, development of therapies for cell migration defects, and identifying novel environmental neurotoxicants. —The hNP1™ Oris™ Cell Migration Assay can quantitatively detect both stimulators and inhibitors of cell migration. —Method development to date indicates that the assay has the potential for adaptation as a homogenous HTS‐suitable cell‐based assay. —Preliminary results suggest that bFGF alone has a potent chemokinetic effect while LIF and GDNF act synergistically to drive migratory behavior during dopaminergic differentiation. I have profiled Steve Stice’s research here. The focus has been the excellent research results he and his team at ArunA Biomedical have generated with STEMEZ(TM) hN2 Human Neurons and hNP1 Human Neural Progenitors. The story continues. He will be presenting the latest at the 9th Annual World Pharmaceutical Congress in Philadelphia, June 14. Topics include: using these neural cell lines to study neurotoxicity in cell-based assays and disease modeling. Recent work conducted in outside laboratories demonstrates that these lines are more sensitive to environmental toxicants than traditional cellular models. These capabilities has been confirmed by our customers. I look for the use of the STEMEZ cell lines to continue to grow as researchers discover their value in Drug Discovery and Basic Neuroscience capabilities. I have featured Steve Stice and his team at ArunA Biomedical and UGA. They are pioneers in developing Embryonic Stem Cell Based Cultures and Assays for Drug Discovery and Basic Research. Given the importance of their work, I am commited to keeping my finger on the pulse of their advances and discoveries. D.W. Machacek, S. K. Dhara, C. Sturkie, K. Hasneen, D. Carter, L. Murrah Hanson, P.R. MacLeish, M. Benveniste, S.L. Stice. DIFFERENTIATION OF HUMAN EMBRYONIC STEM CELL DERIVED NEURAL PROGENITORS INTO FUNCTIONALLY RESPONSIVE POPULATIONS IN THE ABSENCE OF EXOGENOUS EGF.